This super simple salad has all the fresh flavors of summer and takes no time at all to make. It will become your staple for every picnic or cookout! Boil the new potatoes in a saucepan for approximately 12 minutes until just fork tender. Let them cool and then quarter them lengthwise. Mix with the mayonnaise and herbs and season well. Utterly addictive, these crispy fried risotto balls are filled with melted mozzarella and are heavenly when dipped in Jar Goods Classic Spicy Tomato Sauce. Easy to make ahead and fry at the last minute, they make for the perfect appetizer. You can also freeze the risotto balls once made to keep for impromptu gatherings. Heat the butter and olive oil in a large saucepan and then gently sauté the onion for about 6-8 minutes until soft and translucent. Add the rice and cook on medium heat for 3 minutes. Reduce the heat to low and add the wine. Cook until evaporated and then begin to add the stock a ladle at a time, waiting until the stock has cooked down before adding the next. Stir frequently as you are adding your stock. After about 10 minutes, add the saffron threads and mix thoroughly. Continue adding the stock until the rice is tender and creamy, approximately 20 minutes. Add the Parmesan cheese, stir well and season to taste. Leave the risotto to cool. Once the risotto has cooled, add 1 egg and mix in well. Whisk the remaining 2 eggs in a bowl and have another bowl ready with breadcrumbs. Make a 2” ball out of the risotto as if you were making a meatball. Add a small square of mozzarella cheese to the center and cover the risotto around it. Once you have a round ball, dip in the egg mixture and then cover with breadcrumbs and leave to rest on a baking sheet lined with parchment paper. Repeat until you’ve used up all the risotto. At this point, you can freeze the balls or leave them in the fridge for a few hours or go ahead and fry them. Pour enough oil in a large Dutch oven so there’s about 2-3 inches of oil. Heat until oil is very hot but not smoking and gently add the balls in batches so they’re not overcrowded. Fry until golden brown, approximately 3 minutes and then drain on paper towels. Serve immediately with Classic Spicy Tomato sauce. 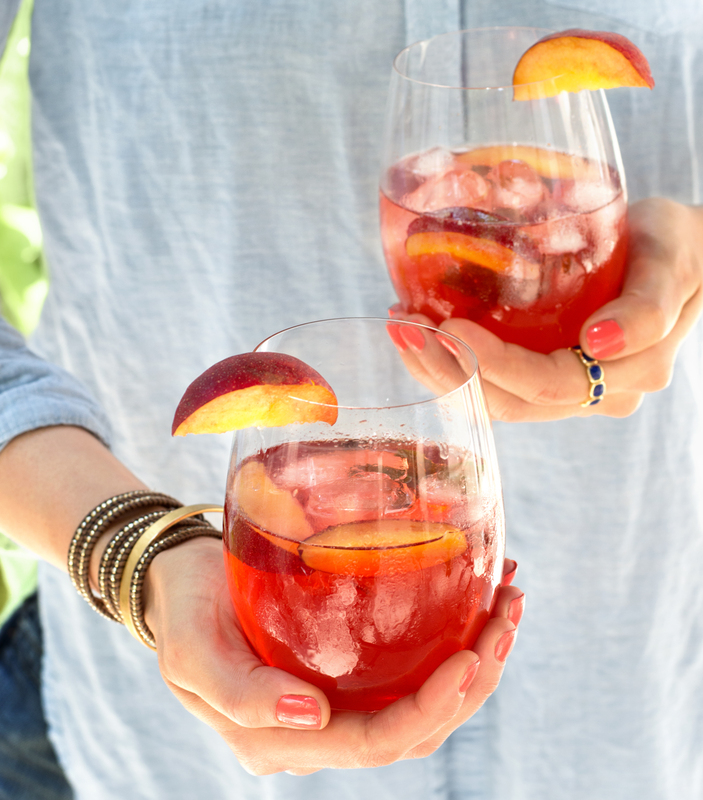 This is an amazingly refreshing cocktail/mocktail to kick off the Summer! Flavored with Cecil & Merl’s delicious cucumber bitters and topped with fresh lime juice and spicy ginger beer, it is as thirst-quenching as it is delectable. The recipe below is for one drink but you may just want to make up a pitcher for your Memorial Day celebration. 1. Combine all the ingredients in a Collins glass over ice. 2. 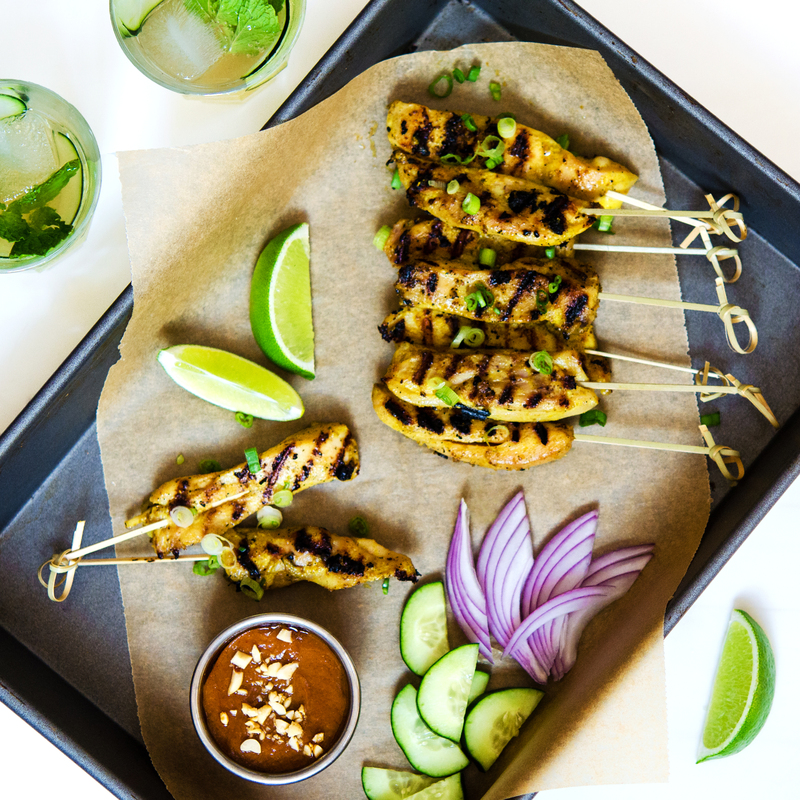 Top with spicy ginger beer and garnish with a cucumber wheel or mint sprig. I’ve always loved the combination of sweet and savory and this tagine adapted from Claudia Roden’s spectacular book Arabesque is, for me, the perfect blend of flavors. By using Spice Tree Organics newest spice blend, Ras El Hanout, I got all the aromas of North Africa without having to hunt through my spice cupboard and use jars that have been languishing far longer than they should have. 1. Heat 2 tablespoons of the oil in a large dutch oven and sauté the onion until soft and translucent. 2. Add the lamb and brown for a 2-3 minutes then stir in the Ras El Hanout and season well with salt and pepper. 3. Add the stock and the cinammon stick and reduce to a simmer. Cover and cook for 2-3 hours or until the meat is fork tender. 4. Add the prunes and honey, then simmer for a further 30 minutes uncovered until the sauce has reduced and thickened. Taste for seasoning. 5. Heat the remaining oil in a frying pan and fry the almonds until they brown. 6. Sprinkle the almonds, parsley and mint over the meat and serve with couscous. For me, one of the definitive signs that Spring has finally arrived is the bounty of fresh asparagus at farmers’ markets and restaurants across NYC. My favorite way to eat it is the way my mother always made them for me with fried eggs so that I can dunk the tips into the yolk. Planning this post for Mother’s Day reminded me of a story she used to tell me. In the spring of 1970, she visited her favorite restaurant in London, the famed but no longer existent Grill at The Connaught hotel. The Maitre D’, also an Italian, let her know that they had just got in the first asparagus of the season and she asked if the chef would do them ‘alla Parmigiana’. Being a regular and heavily pregnant with my brother, the chef agreed to accommodate her unusual request. Soon four waiters appeared, each carrying trays, the contents of which were concealed under large silver domes. With great theatrics, the waiters lifted the domes simultaneously to reveal four dishes; one with the steamed asparagus, one with the fried eggs, one with the browned butter and the last with the grated Parmesan cheese. At this point all the other tables were craning their necks and asking if they can have the same and lore has it, that from that day on, Asparagus alla Parmigiana became a regular dish at The Connaught. 1. Bring a large pot of water to a boil and cover with a bamboo steamer. Lay the asparagus flat in the steamer, cover and cook for 4-5 minutes – asparagus should be tender but still crisp. 2. In a large frying pan, heat the butter on high until it begins to foam then carefully crack the eggs into the hot butter. Once the eggs have begun to set, tip the pan and baste the eggs with the hot butter using a spoon. I like the edges of the egg white to get nice and brown. 3. Divide the asparagus between 2 plates, cover each with a fried egg and some of the browned butter. Top with grated Parmesan cheese and season with salt and pepper. Serve immediately. Of all the things I miss about my old job, wandering the night markets of South East Asia and eating my bodyweight in street food ranks pretty high. Could it possibly be true that the Thai government has banned street food in Bangkok? It seems as unimaginable as a New York City without yellow cabs. Among my favorite street foods are the ubiquitous chicken satay and their constant companion, peanut sauce. A perfect warm weather appetizer, you don’t have to travel to the other side of the world to get it. It was my first attempt at making satay and I couldn’t believe how easy it was and how in one bite, I was transported to the sounds and smells of those bustling street markets. The chicken in this recipe is incredibly tender from the coconut milk and packed with rich flavor from Spice Tree Organics’ new Malaysian Curry blend and The Saucey Sauce Company’s fish sauce. 1. Clean the chicken thighs from excess fat and cut into strips of desirable length (4″ x 1.5″). 2. In a large bowl mix the coconut milk, fish sauce, curry blend and sugar. Mix well. Add the chicken strips and make sure well coated in marinade. Let sit for at least one hour, ideally overnight for best flavor. 3. Soak wooden skewers in water for 20 minutes pre cooking to make sure they don’t burn in oven/on grill. Remove skewers from water. 4. Preheat oven to broil or heat grill. Remove chicken from marinade and skewer each strip lengthwise. Broil/Grill for 2 to 3 minutes on each side until golden brown and cooked through. 5. Serve hot alongside peanut sauce and enjoy! Master tea blender and founder of Tay Tea, Nini Ordoubadi, makes this thirst quenching “mocktail” with one of my favorite of her many exquisite blended teas, Kaapstad. Named after the Africaans name for Capetown, it is made with vanilla rooibos, ginger, almond and marigold petals. As the warm weather finally appears, the peach and mint make this an extra refreshing non-alcoholic drink. No-one’s stopping you from adding a splash of gin though, to give it an extra kick. 1. Muddle all ingredients in a  cocktail shaker. 2. Shake and strain into an ice-filled glass. 3. Garnish with a peach slice and a sprig of mint. Hansen has surprised and delighted us yet again with a new marinade, Korean Gochujang. In searching for the perfect recipe to highlight his new smoky and sweet sauce, we knew that a delicious Korean beef dish would be the way to go. This meal is incredibly easy, comes together in minutes and needs very few ingredients. It is the perfect weekday lunch or dinner that will satisfy your yen for succulent and savory Korean beef. 1. In a large frying pan, heat your oil until sizzling. 2. Add your onions and cook for 3 minutes, stirring regularly. 3. Add the hanger steak and cook for 2 minutes until partially cooked through. 4. Add Gochujang and stir for 2 minutes until all ingredients are evenly coated and the beef is cooked through. 5. Garnish with scallion and sesame seeds and serve over white rice. Sometimes there’s nothing quite like a sweet shortcut when you’re pressed for time. My favorite cheats are sweet cheats. We all lead busy lives and the idea of baking a pie after a long day’s work can seem like a step too far. Years ago, one of my best friends whipped up this “faux” tarte tatin in minutes, and had I not seen her do it I would never have believed it was so easy. It’s now my go-to recipe for a dinner party dessert, and one that I rarely have to leave the house to make; it has just four ingredients, all of which I usually have on hand. So when you find yourself stuck with a last-minute guest coming to dinner, or you have been asked to bring a dessert to a potluck dinner, I’d highly recommend giving this a try. The “faux” creme anglaise sauce that I serve alongside is the best cheat of all. It is melted vanilla ice cream! Could anything be simpler than that? I pour it over everything from brownies to mixed berries but it’s absolutely perfect with apple pie. 1. Heat the oven to 350 degrees F.
2. In a small saucepan, melt the butter and sugar until you have a smooth liquid. 3. Peel and slice the apples (I cheated and used an apple corer and divider) and mix with the butter and sugar. 4. Butter a round cake pan (I used a 9-inch) and arrange the apple slices in a fan. Scatter what’s left over on top. 5. Place the sheet of pastry over the apples; you may need to roll it a little to get it to be big enough. 6. Trim the pastry to the edges of the tin. 7. Bake for 45 minutes or until the pastry looks perfectly browned. 8. Invert onto a plate and serve with melted vanilla ice cream or, as I like to call it, creme anglaise! There’s no two ways about it, for this recipe you need a Madeleine pan, but the fact that within 20 minutes you can always whip up a batch of these soft, buttery French classics should be enough to convince you to get one. You can make them without raspberries but I loved the touch of tartness and juiciness that they added. 1. Preheat the oven to 375°F/190°C. 2. In a small saucepan, melt the butter and set aside. 3. In a large bowl, beat the eggs and sugar until the mixture becomes pale. 4. Sift the flour into the bowl, then add the baking soda and butter to the mixture. Stir well until smooth. 5. Butter up the madeleine molds well and add mixture to mold until each is 3/4 full. Nestle a raspberry half in the middle of each one. 6. Bake for 10 – 15 minutes until the color is just beginning to turn. They pop right out of their molds and can be served immediately.